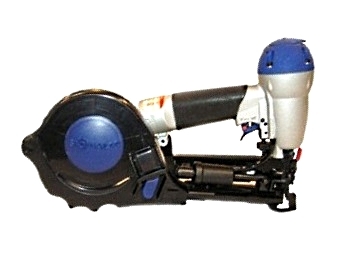 Spotnails CrossFire #LCS6838 Plastic Cap Stapler, Pneumatic. Shoots 18 gauge Staples / Plastic Cap. More holding power than a plastic cap nail. Staples capability is 5/8 to 1-1/2 inch leg. Price/Each. No Air Shipping. Signature required for delivery. Warning: security tracking chips embedded. A compact size, lightweight combo plastic cap stapler with high production performance options. This unit has evolved several times. From LCS 6832 to TCS 6832, to TCS 6838, to current LCS 6838. Fasteners: 5/8", 7/8", 1-1/4", 1-1/2"
3/8 Inch ID X 100 FT. RED AIR HOSE (AIRHOSE), 250 PSI, PLIOVIC WITH 1/4 In. MALE NPT BRASS FITTINGS. COST/HOSE. #136054, 1-1/2 inch STINGER / CROSSFIRE STAPLEPAC. Contains 2000 1 inch OD Plastic Caps and 2000 1-1/4 length x 7/8 Crown 18 Gauge Staples. Works with CS150. Does not fit CH38 or CS58. Price/Pack. #136074, 1-1/4 inch STINGER / CROSSFIRE STAPLEPAC. Contains 2000 1 inch OD Plastic Caps and 2000 1-1/4 length x 7/8 Crown 18 Gauge Staples. Works with CS150. Does not fit CH38 or CS58. Price/Pack. #136044, 7/8 in. STINGER / CROSSFIRE STAPLEPAC. Contains 2000 1 inch OD Plastic Caps and 2000 7/8 length x 7/8 Crown 18 Gauge Staples. Works with CS150. Does not fit CH38 or CS58. Price/Pack.